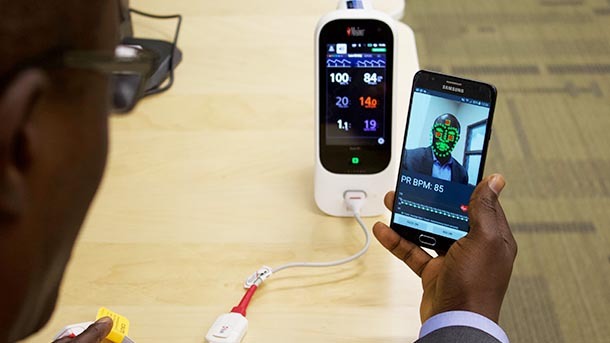 Conrad Tucker demonstrates how a mobile-based application will use a cell phone camera and computer vision techniques to capture pulse rate. Tucker and his team use a Masimo Rad-97, a compact, portable patient monitoring device which measures pulse rate, respiratory rate, oxygen saturation, perfusion index, total hemoglobin and pleth variability index, as a ground to compare the application’s captured data. UNIVERSITY PARK, Pa. — As biometric systems, technologies which measure biological information to identify a person, continue to advance, their potential impact on health care capabilities surge. Via tools such as fingerprint recognition, face recognition, iris and retina recognition and vein recognition, health care workers are provided with increasingly sophisticated ways to monitor patients. Researchers from Penn State and Johns Hopkins University are working to develop additional capabilities by capturing vital signs of patients in resource-constrained environments with a device most Americans use every day — a cell phone camera. 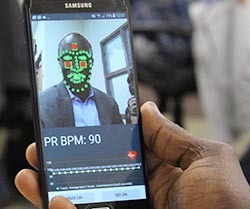 Funded by an initial $100,000 pilot grant from the Bill and Melinda Gates Foundation, “Non-Contact Estimation of Biomarkers in Resource-Constrained Environments,” uses cell phone camera and computer vision techniques to capture patients’ vital signs at distances of up to four feet away — a critical distance needed for highly contagious disease like Ebola or tuberculosis. Led by Conrad Tucker, associate professor of engineering design and industrial engineering at Penn State, the mobile application will register natural head and body movements, distinguish between different skin tones and lighting conditions, and capture vital signs such as an individual’s pulse rate. Collaborators at Johns Hopkins include Dr. William Checkley, M.D., Ph.D., associate professor of medicine and director of the Johns Hopkins Center for Global Non Communicable Diseases Research and Training, and his team of researchers. Jeffrey Gray, professor in the Department of Chemical and Biomolecular Engineering at Johns Hopkins, played an instrumental role in connecting the Penn State and Johns Hopkins teams. To test the proposed application in real-world situations, Tucker and his Ph.D. student, Sakthi Prakash, will travel to India and Sierra Leone in December 2018 and March 2019. Testing locations were selected due to the team’s hands-on experience in these countries, along with the opportunity to engage with a diverse group of individuals to test in varying environmental conditions. Penn State faculty members Soundar Kumara, Allen E. Pearce and Allen M. Pearce Professor of Industrial Engineering, and M. Jeya Chandra, professor emeritus in industrial engineering, have helped the team forge new collaborations in India. University of Illinois faculty member Paul McNamara, associate professor of agricultural and consumer economics, helped the team achieve similar collaborations through his established stakeholder network in Sierra Leone. Initial findings will be presented to the Bill and Melinda Gates Foundation in early 2019. A return trip to India and Sierra Leone will take place in summer 2019 to collect additional data. Pilot results are expected to be released after this return trip. The team has tested the application’s functionality on the Xiaomi Redmi 6 and the Samsung Galaxy J7 Prime, cell phones that are typically used in these countries, due to their relative affordability and availability in these areas. On November 26, Tucker traveled to the Bill and Melinda Gates Foundation headquarters in Seattle to meet with a program manager from the foundation and members of the team to demo the mobile app that the team has developed and to discuss the team’s plan of action for their upcoming international travel. To follow research efforts, findings and method validation, visit www.videovitals.org. 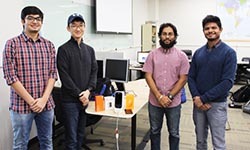 Tucker’s Penn State research team consists of (from left): Deven Patel Bhagyeshkumar, computer engineering senior; Chonghan Lee, computer science and engineering graduate student; Sundararajan Srimattirumalapeddinti, computer science junior; and Sakthi Kumar Arul Prakash, industrial engineering doctoral candidate. For the initial study, the mobile application will capture only pulse rate. Future work will expand on the other data types measured by the Masimo Rad-97. Can social media data be used to predict threats or identify fake news?